There is something very beautiful about the inside of the human eye. Some call it the “window to the soul,” but to an ophthalmologist it’s a window to the body’s condition. When one’s body is healthy, the retina will look healthy (like the one above); however, when one is stricken with diseases such as diabetes, high blood pressure, sarcoidosis, or cancer, the retina can have a very different appearance. Some fun facts about the retina: the total area is about 1094 square millimeters and 72% of the inside of your eyeball is lined with retina. The retina is made up of many layers of nerve cells and is the substrate upon which light falls as it enters your eye. Objects that you see reflect light and those rays of light are focused by your tear film, your cornea, and the lens of your eye. Then the light hits the retina and gets absorbed by photoreceptor cells. Those cells transmit and process the light and send signals through other cellular layers to the retinal nerve fiber layer. The nerve fibers run on the surface of the retina and all come together to form the optic nerve (the circular structure on the left side of the photo above). All one million of these fibers travel down the optic neve and eventually connect with the visual centers in the back of your brain. Then you can see. Pretty amazing stuff. To give you a sense of scale, the optic nerve above is about 1.75 mm in diameter and the retina is about 0.3 mm thick — front to back. Your retina begins to develop when you are a fetus and doesn’t reach it’s full potential until 4 years of age. There are 6.4 million cones for use in bright light conditions in the retina and 110 – 125 million rods for use in low light conditions. The rods are most dense about 18 degrees from the center of fixation. That’s why if you try to look directly at something in the dark, it will be difficult to see it, but if you look slightly off center (try 18 degrees), you will be able to see it better. There is so much going on in this beautiful structure to help us see and I feel privileged to look at retinas all day long and help patients see better so that they can fully enjoy their lives. 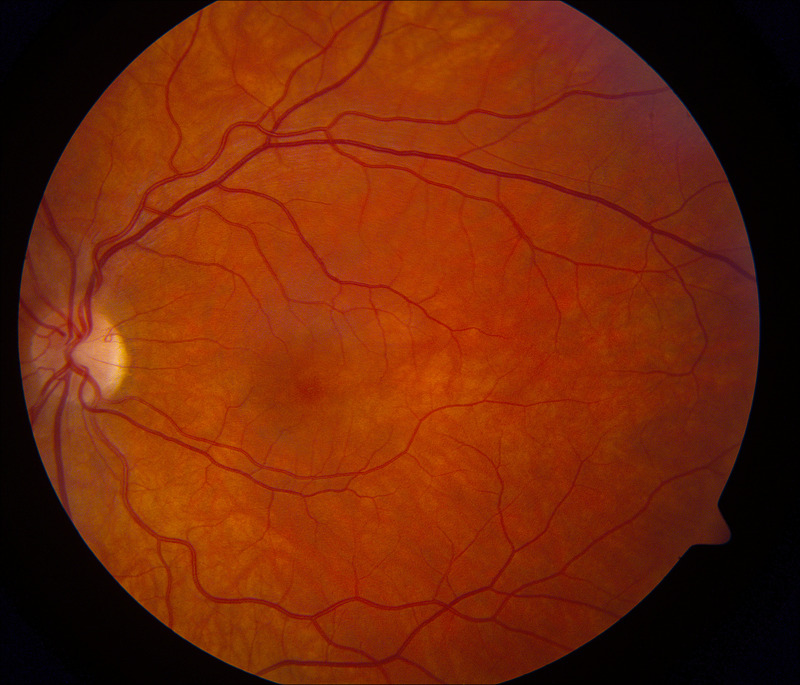 This entry was posted on April 3, 2012 by visionmd in The Eye and tagged eye, ophthalmology, retina.